Pullback in Motion. Dow by Itself. The Dow has now seen three straight days of negative behavior but the index remains a whisker from new highs. The big picture reveals some almost precedent setting behavior in the Dow as more stocks are closing lower than higher as the Dow was hitting all-time highs. That’s not your typical sign of strength. The S&P 500 and S&P 400 are a little weaker with the Russell 2000 and NASDAQ 100 a little more so. The pullback I have been discussing all month is here as I mentioned on Monday. I still not expect it to be anything major, significant or worrisome. In fact, it could even just be a sideways pause. While overall sector leadership remains very constructive, semis are extended and transports and discretionary need some time here. Banks are stepping up and they should see new highs later this quarter. High yield bonds finally pulled back and the NYSE A/D Line looks to be rolling over in the short-term. This is all happening against the backdrop of strong earnings which are being sold into. Buy the rumor, sell the news. Long time readers know my theme of a secular bull market in the dollar that has been put on hold in 2017. Don’t let the media fool you. The bull market ain’t over. The greenback bottomed and is rallying again. The euro is in big trouble as is the yen. They should both be going sharply lower next year and after that. It’s going to get ugly. It’s really the same old story as we begin the new week and the final full week of October. 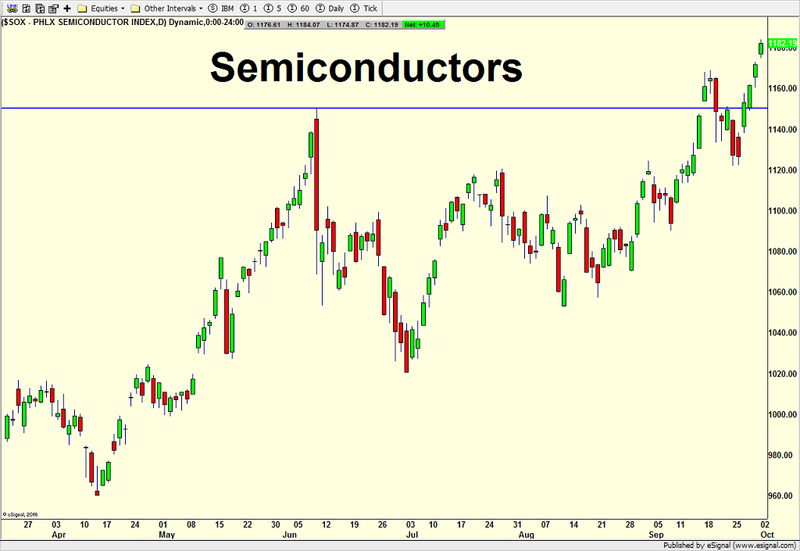 The intermediate and long-term continue to look strong as they have for days, weeks, months and quarters. Nothing has changed. The short-term is the time frame where it’s neutral at best. I have said all month that the bulls need a little rest, but they haven’t seemed to care. 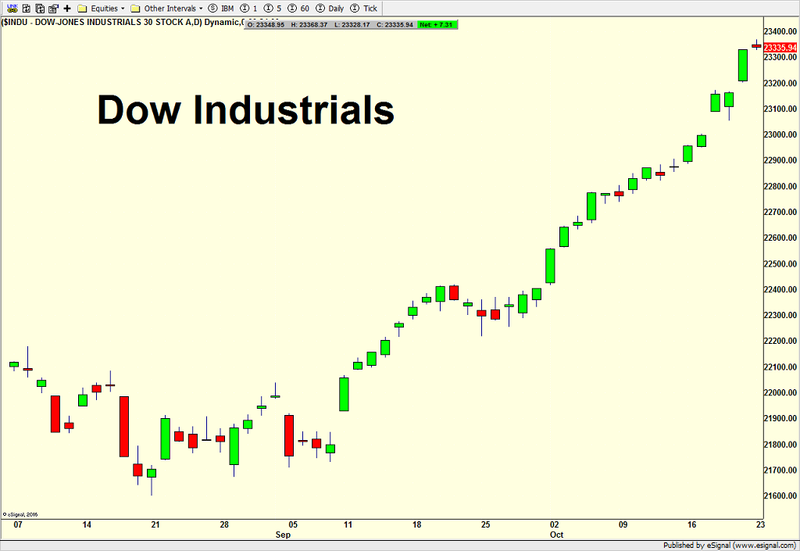 Today, as I look at the five major stock market indices, the Dow is looking more and more like a tech stock and the NASDAQ 100 like a stodgy Dow stock. That’s not exactly the behavior normally seen in the healthiest of markets. However, as I wrote last week, the bulls have been running like they’re in Pamplona! At this point, there aren’t many cracks to concern me more than just a cessation of the advance or the modest pullback I have been wrongly writing about all month. Key sector leadership is good. Secondary leadership from industrials, materials, energy and healthcare is even better. High yield bonds and the NYSE A/D Line are at all-time highs. It’s been one of those “creeper” markets as Jason Goepfert of Sentiment Trader calls it, where day in and day out, stocks just slowly climb higher and higher. Martin Armstrong, one of the few outside reads I have, calls it a “vertical market” where everyone “gets drunk at the party but no one is really having a good time”. It’s the kind of market where is you are long, you just sit back and grin. If you have been waiting to buy, it hasn’t been any fun. Having been on the wrong side of a creeper years ago, it was one of the most frustrating periods in my 20 year career. The bottom line is that stocks remain a little tired and if that modest pullback is coming, it should be here right now. This is looking more and more the running of the bulls in Pamplona. They just stampede anyone and everyone in their way. After the two strongly positive seasonal trends ended after the first week of October, there was sufficient evidence that stocks were due for a pause to refresh or modest, single digit pullback. That’s what I was looking for. Nothing big. Nothing significant. Nothing really actionable. Just your garden variety reset. Stocks came out of the gate to the upside on Friday after what I kiddingly referred to as a one day bear market on Thursday. All of the major stock market indices are at or essentially at all-time highs. Bears can’t argue with that. My four key sectors are also acting very well with semis and banks at new relative highs with transports and discretionary catching up. In recent weeks, I wrote about the poor behavior by the banks, but that is changing today. High yields, while not leading and looking a little lifeless, are still just a day or two from all-time highs. 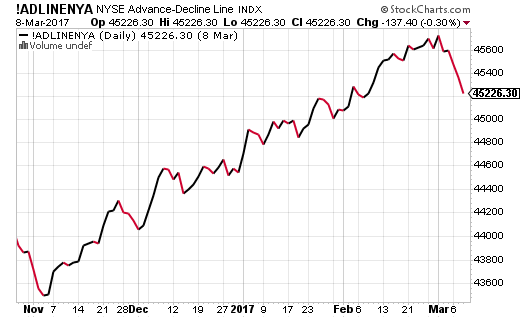 The NYSE A/D Line is also just a whisker from new highs. On the other hand, defensive sectors, like utilities, telecom and staples are the worst sector performers. For the first time since Q1, bond yields look they could break out to the upside and see the 10-year note head above 2.6%. That would be a huge tailwind for banks and signal that the economy may be heating up. Good Monday Morning! Huge weekend if you are a sports fan although the decision making of my Yankees’ and Cowboys’ manager and coach likely just ended their seasons. At that level, the margin for blunders is razor thin and both Girardi (4 stupid decisions in 40 min) and Garrett (one giant brain freeze) cost their teams. While I have never been in their shoes, it’s the same thing I face each and every market day. Over the past 29 years, I have probably made every bad decision one can make, but hopefully, I learn from those as I move forward. Stocks begin the week with all five major stock market indices at fresh new highs along with high yield bonds and the NYSE A/D Line. So are the banks, semis and transports among key sectors. As I have said over and over and over again since 2010, bull markets do not end with this type of behavior. Sorry to all of the bull markets haters and disavowers; you have been wrong, are wrong and will be wrong until the evidence changes. And when they are finally right, I am sure they will crow about how they knew it all along. Reality over rhetoric. With all that said, the very short-term has an opportunity to change right here and now. If there is going to be the mild, modest pullback in October which I have written about lately, stocks should peak this week for three reasons. 1 – September ended at its highest close of the month for the S&P 500. That leads to another week of strength, roughly 1%, and then a give back of more than 1%. 2 – When October begins the month in an uptrend, the first five days tends to be higher. However, the next five and the five days after that and the final five days of the month all show mildly negative returns of roughly -0.25% each period. 3 – Stocks rallied hard into the beginning of Q3 earnings season, using up a lot of fuel. That usually means earnings are priced for perfection and rarely exceed expectations. BONUS – The Economist and Barrons have run very bullish headlines this month about how the global markets and economies are hitting on all cylinders. Additionally, the term “melt up” is all over the place on blogs and Twitter. While this is nowhere even close to the true irrational exuberance of 1999 and early 2000, it does give bulls a little cause for short-term concern. Finally, I am not going to rehash the piece I wrote about the negativity of Octobers in years ending in “7”, but you can reread it HERE. Looking at the economic news of the day, jobs created in September actually declined for the first time since 2011. On the surface, that would be shockingly disappointing and brings in calls for recession. However, all of the drop from the expected 100,000 created will be attributed to the hurricanes. The unemployment rate surprisingly fell to 4.2% from the expected 4.4%. Until the economies in Texas and Florida get back to somewhat normal behavior, job numbers are going to be volatile and more difficult to assess. Turning to the markets, as I wrote about earlier this week, all of the major stock market indices saw new highs this week. This was expected as we have strong seasonality from October beginning the month in an uptrend as well as September ending the month at its highest close. Both of those tailwinds end TODAY with the October seasonal trends turning negative for the next three weeks. Additionally, stocks have rallied very hard into the beginning of earnings season which is now. Put another way, stocks have exhausted a lot of energy as companies begin to report Q3 earnings. It’s going to be difficult to maintain the rate of ascent, not to mention that companies better not disappoint. While all of this may sound negative, I want to be crystal clear that I absolutely do not believe the bull market ended or is close to ending. I only have some very short-term concerns which may translate into a modest low to mid single digit pullback in stocks. Nothing to worry about over the intermediate or long-term. Semis, banks and transports all made new highs and discretionary has ceased lagging significantly. Industrials, materials and all at or near new highs. Energy is rallying sharply. All this as defensive sectors like REITs, staples and utilities are lagging. The recipe for higher prices remains firmly intact into year-end and into 2018. After a solid end to September and Q3, stocks open the new day, week, month and quarter flirting with all-time highs. 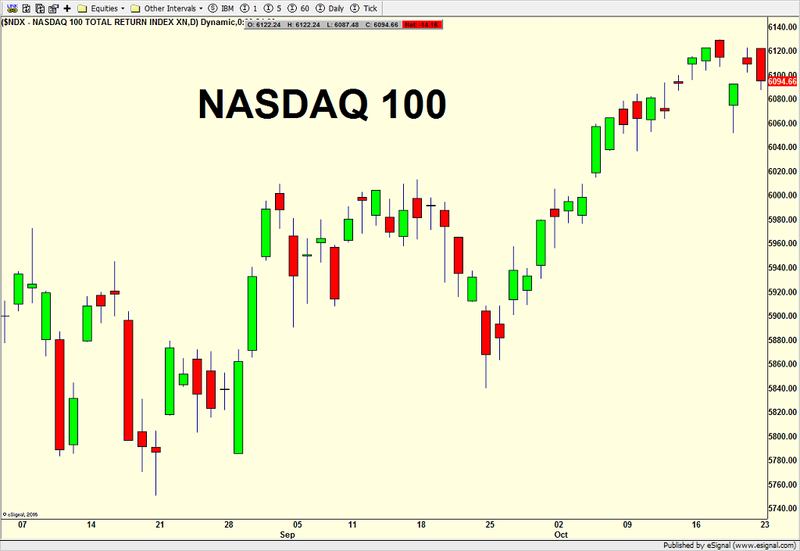 Of the major indices, only the NASDAQ 100 isn’t there, but I expect to see that achievement this week. When I think of October, Reggie Jackson’s three home run game in 1977 comes to mind along with Halloween, fall foliage and stock market crashes. As I already wrote about, while October is known for huge market swings, 2017 is on the atypical side with near record low volatility. I updated my research regarding October and you can read about it HERE. Additionally, the always interesting Rob Hanna from Quantifiable Edges offered that when the S&P 500 closes the month at its highest close, the next 5 trading days are seasonally very strong with 21 wins and 7 losses since 1995. The average trade earned a stout 1%. This trend jibes very well with what I discovered about the first 5 days of October in an uptrend. I will be looking for a short-term peak next week. Since late July, my overall theme has been one of pause to refresh with a mild pullback as the five major stock market indices were certainly not all in gear to the upside. Two months later, with the S&P 400 and Russell 2000 recently surging, they are all getting closer together. That behavior comes at the expense of the NASDAQ 100 peaking earlier this month and moving sideways for the others to catch up. I fully expect November and December to see all five major indices scoring all-time highs at the same time although I am still not ready to declare that stocks are ready to blast off to the upside. I have written much about the semis and banks as a tale of two key sectors moving in opposite directions. While semis broke out to new highs, banks finally got off the rear end and surged 10%, close to new highs, a very positive sign. Transports behaved similarly, but even stronger. Discretionary, leaders in most years since the bear market low in 2009, look like they are peaking, at least over the intermediate-term which could spell some trouble for the consumer. Somewhat quietly as I have written about before, energy has become the single strongest sector after some horrific declines. All in all, stocks are closing out the quarter on fairly solid footing and poised for higher highs into year-end. Pullback Remains in Place. Junk May Hold Key. The short-term pullback I have seemingly written about for weeks and weeks remains in place although I am certainly not taking credit for calling it in a timely fashion. The Dow, S&P 500 and NASDAQ 100 have all pulled back constructively while the S&P 400 and Russell 2000 are uglier. The three stronger indices are just about to kiss their 21 day moving averages, while their weak cousins knifed right through the 21 as well as their 50 day moving averages. While the 3-5% pullback I keep talking about is here, the average stock is now off roughly 10% which is masked by the strength in the major indices. Turning to the four key sectors, banks, semis and discretionary are holding up very well and only a solid two day rally or so from new highs. 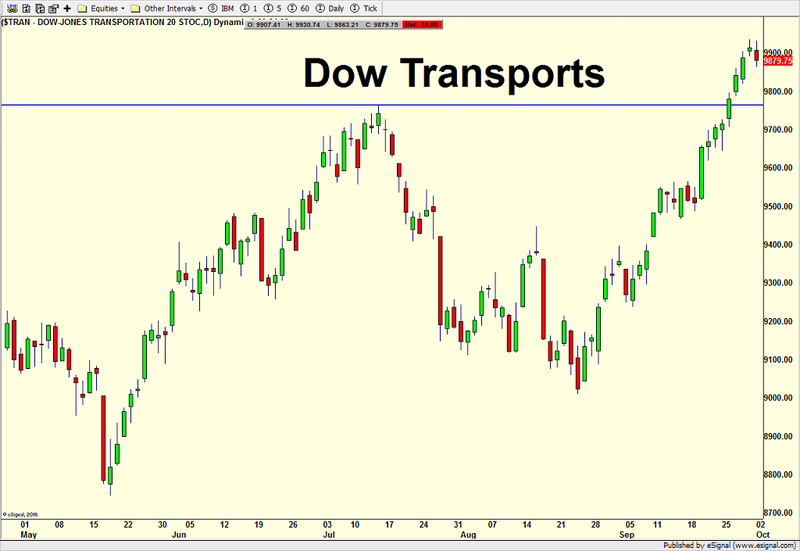 Transports, however, are under more pressure although certainly not bull marketing ending behavior. Both high yield bonds and the NYSE A/D Line saw all-time highs in early March, but have since pulled back more significantly which is something I discussed recently. 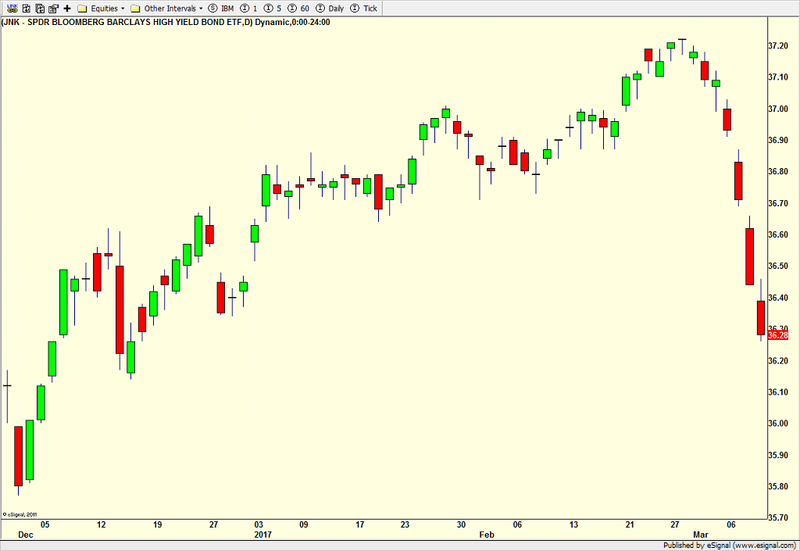 The junk bond decline definitely has my attention and should be watched very closely. The sector began to lag last week and is now down sharply this week. The A/D Line, while weak, is still behaving constructively. Stocks are finally pulling back and giving all those folks who sold last February, post-BREXIT and at the election a time to buy. I doubt they will until the train leaves the station again. The bull market isn’t over. We had a lot of negative news between Friday’s market close and Monday’s open, almost all on the geopolitical front with the vast majority surrounding President Trump. Of course, Deutsche Bank finally agreeing with the markets that they needed to raise capital was icing on the cake. In a weak market, that backdrop would have yielded a 1-2% lower opening on Monday. In a strong market, we’re talking about .25-.50% lower. Stocks are due and have been due for a pullback or at least a pause to refresh. That looks like what’s happening right now. With so many investors on the outside looking in, any weakness should be mild and followed by further strength until more serious cracks in the pavement develop. I found it interesting that CNBC’s Fast Money midday report was all about the Trump rally ending. I think those pundits will regret those words. As I watch the major indices and sectors come off their morning lows, I can’t help but notice that high yield bonds are not following suit and lagging. One day or a few days means absolutely nothing, however, should stocks rally with junk bonds falling, I would become more concerned. After what has been celebrated as this huge, epic rally on Wednesday, the major stock market indices gave back all of their post 9:30am gains and then some on Thursday. I mentioned the other day that volatility compression leads to volatility expansion and vice versa. When the volatility Genie finally gets out of the bottle, we will probably see a sustained increase. I think we’re close to that now. Please remember, volatility does not always mean decline. It means wider price movement in both directions. Right now, the important takeaways from the week are that small and mid caps look the most vulnerable, relatively speaking. All of the indices remain overbought and stretched but I do not see a large scale decline unfolding. Emerging markets and commodities are under pressure with gold clearly failing at its 200 day moving average. I wrote about oil peaking the other day and the decline may be starting. High yield bonds and the NYSE Advance/Decline Line continue to act well which should buffer the downside. Three out of four key sectors scored fresh highs this with semis very close although banks saw a nasty reversal from new highs on Thursday. Altogether, this behavior remains very typical of bull markets. Weakness should be bought.